• Your child will enjoy playing with balls that bounce lower and move slower through the air, making them easier to hit. • Racquets are sized for small hands, making them easier to grip and swing. 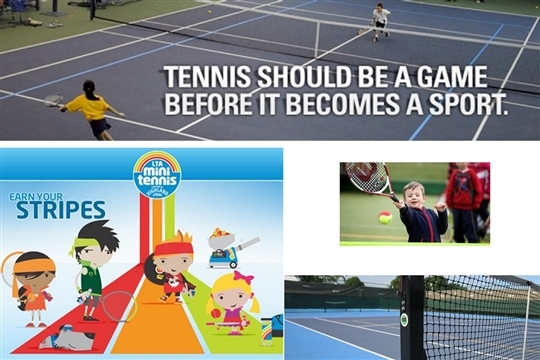 • Courts are smaller, so kids can cover them and have more success when they play. • Kids have more fun—and want to play more often. • Tennis is a sport that gets kids moving, improves balance, agility and hand-eye coordination, and can teach self-confidence and self-assurance. • Playing tennis, your child can make new friends in a safe, supportive environment. • Your whole family can play together anywhere–driveways, gyms and playgrounds can all be transformed into your very own tennis court. By getting your kids into the game you’ll be opening a door to a lifetime of enjoyment! Contact the coach for more information. Coaching sessions will be tailored according to age and ability.